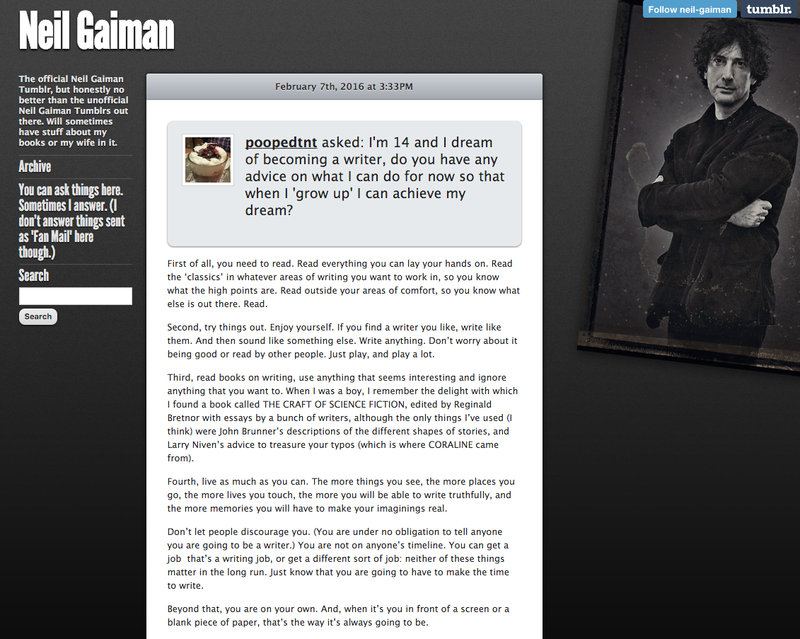 Q: How do you deal with negative criticism? A: The same way I deal with positive criticism. I write The Next Thing. 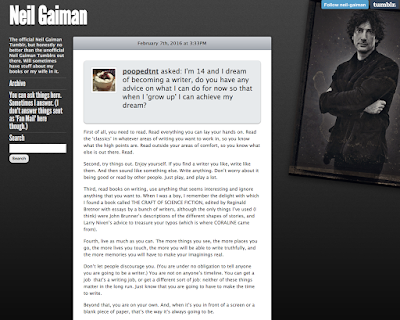 There's lots more, as shared on Neil's Tumblr and widely reported, including in this Bustle article. "You know who comes from where, after all, how they talk, what kind of foods they eat. But I only tend to tag the skin colour of the white characters in the book when they first show up." He gives a bunch of examples from Anansi Boys and then talks about how "race isn’t just skin-colour." "One of the joys of fiction is problem-solving. You can wind up rooting for anybody as long as they use their brains to get out of trouble. Actually, it's a way to make an unsympathetic protagonist or even antagonist really sympathetic. Put them in a really difficult situation, and then make them figure it out. Your character is deep in trouble, don't have them fight their way out. Have them think their way out, and solve their problem by the kind of knowledge everybody ought to know--including the reader, who can then go, "Oh my gosh, I could have done that." Jen wrote to let me know about her blog, Girl & Duck, that supplements her Melbourne, Australia-based writing fiction for kids class. #6: Kids love to be scared. But not too scared! #10: Checklist! All senses covered? Sight, sound, taste, touch & smell. It will be fun to see where Jen takes us next. 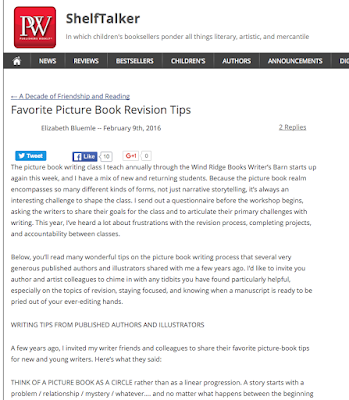 I thought this article, "Favorite Picture Book Revision Tips" was great. 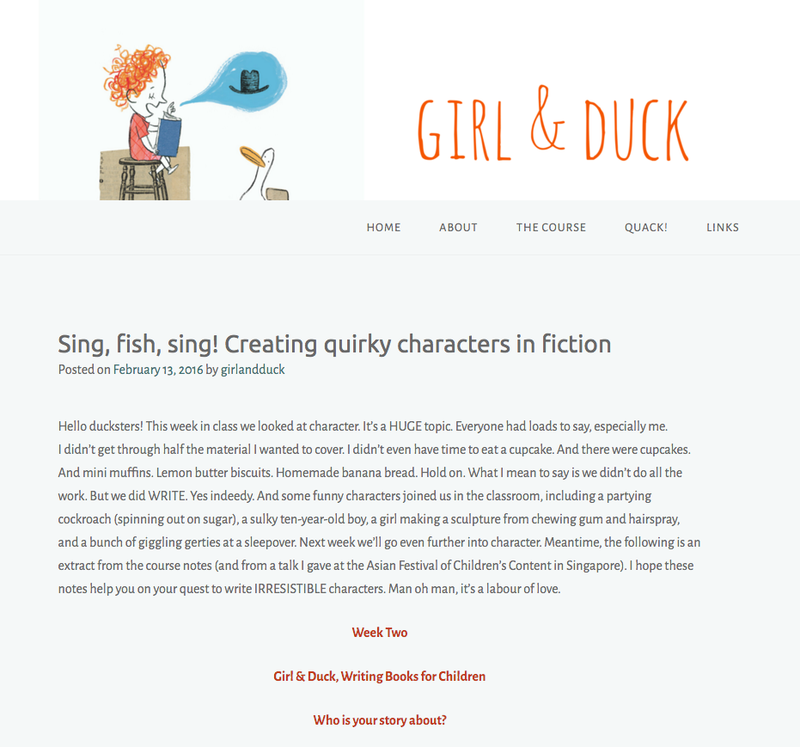 For those of us writing and/or illustrating picture books, it's well worth checking out. Kate Messner & Linda Urban reminded us to look at each other in a room "filled with magic": creativity, support & encouragement! "You are the ambassador of Planet You." Starting #NY16SCBWI w/ the AMAZING William Joyce @heybilljoyce. Here we go! Another reason to love #NY16SCBWI is meeting my idols. Thank you @rainbowrowell !! Brought to tears at #NY16SCBWI by Gary D. Schmidt. Kidlit writers need to show up for the kids who need someone to do just that. What were YOUR favorite moments/tweets/quotes? Tell us in comments! Open Call for the #NY16SCBWI Illustrator Journals! Just go to the #NY16SCBWI Conference Illustrator Journal post at The Official SCBWI Conference Blog, and, in comments, add a link to your image that you've posted somewhere online. It's that easy! We can't wait to see what you all come up with. 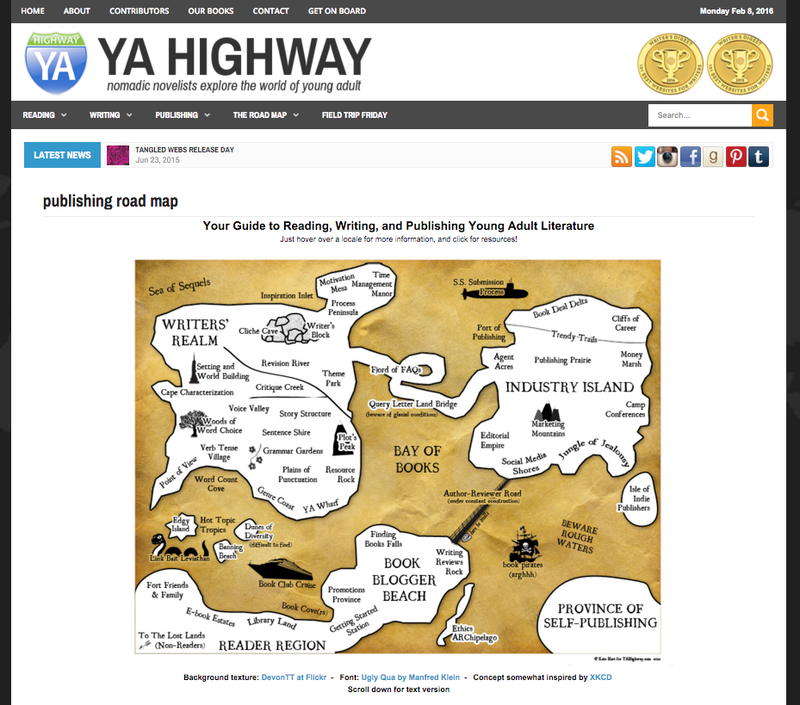 This "Publishing Road Map" the folks at YA Highway have put together is so clever! The links in those list are well-worth the time, not coincidentally including "Your Time Is Your Currency" by famed author Laurie Halse Anderson. 'Agent Acres' is busting with advice (with nearly 50 articles, websites and resources), and you can visit 'E-Book Estates', the 'Province of Self-Publishing' and 'Money Marsh' (How Much Do Authors Get Paid) all in the same day! It's a great resource. Check it out. How Does Dean Koontz Build A Novel? This photo of two scientists studying the Great Barrier Reef, one in the process of writing, seemed too good to not include! How do we build a novel? Or a picture book, or a chapter book, for that matter? Our 2015 Work In Progress Grant Winners! Opportunity is one of pillars of SCBWI, and the Work In Progress Grants is opportunity in action. 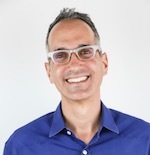 Winning manuscripts are "showcased on a secure website so that the work can be exposed to selected acquiring editors, giving these authors exclusive access to some of the most sought after professionals in the business." 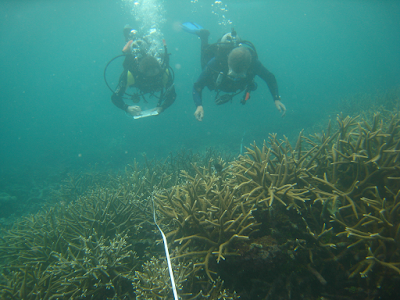 One of the 2015 winners has already had their manuscript acquired! PB Text: Peggy Archer "Toad in the Road"
Come along with Toad on his whimsical adventure with its rhythmic, infectious (rollicking) language, sure to delight young children. This manuscript has been acquired by Schwartz and Wade. Chapter Book/Early Reader: Lorrie-Ann Melnick "Haunted Key Mystery: Help! I'm Haunted"
Middle Grade: Beth Cahn "Chasing Gold"
Nonfiction: Donna Janell Bowman "Tomboy: Daring Life of Blanche Stewart Scott"
Multicultural: Suma Subramaniam "Walking on a Tightrope"
And if you want to submit your work for the 2016 Work In Progress Grants, go here for all the information. Submissions open March 1, 2016.